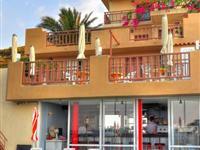 Situated on a hill, on the main road just a few minute s walk from the centre of Stalis and the sandy beach. The studios and apartments sleep between 2 and 4 people, some beds are cretan style (concrete based). All with bathroom, kitchenette, hairdryer, air conditioning and safety deposit box (both payable locally), private or shared balcony or patio, most with sea views. There are numerous steps at this property, so it may not be suitable for those with walking difficulties.